We breed and humanely raise a mix of Heritage breed pigs to obtain a diverse and high quality meat product. 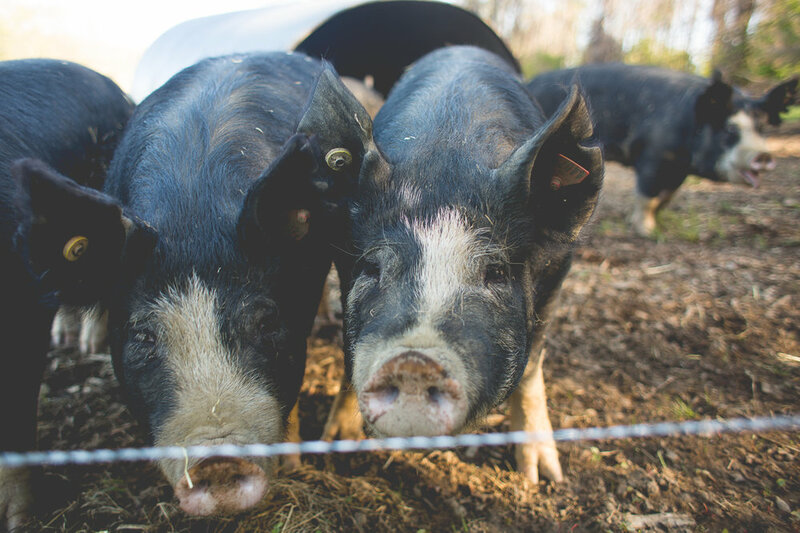 In order to maintain genetic diversity on our farm, we raise three groups of heritage pigs. Our first group are pure Berkshire pigs. The Berkshire pig was discovered over 300 years ago in Berkshire County in the United Kingdom. The Japanese, known for prizing kobe beef from wagyu cattle, also prize 100% Berkshire pork, calling it kurobuta. The second group is a mix of Heritage breeds including Yorkshire, Berkshire, Large Black and Tamworth. These animals were sourced from a farm that has been selectively cross breeding pigs to graze on pasture, have good temperaments, make good mothers and ultimately produce a better meat quality and marbling. Our method of pasturing pork combined with their diet creates impeccable flavor. When pasture-raised meat is good, it's unforgettable...the meat is dense, but not tough and the fat melts slowly, so pork is renowned for its richness, texture, marbling, juiciness, tenderness and overall depth of flavor. Our philosophy is to monitor the health of our animals on a daily basis. We do not use growth hormones or any other unnatural supplements. For humane reasons, we may administer antibiotics of the pigs health is at risk. Our pastured pork is for sale in our on-farm store.